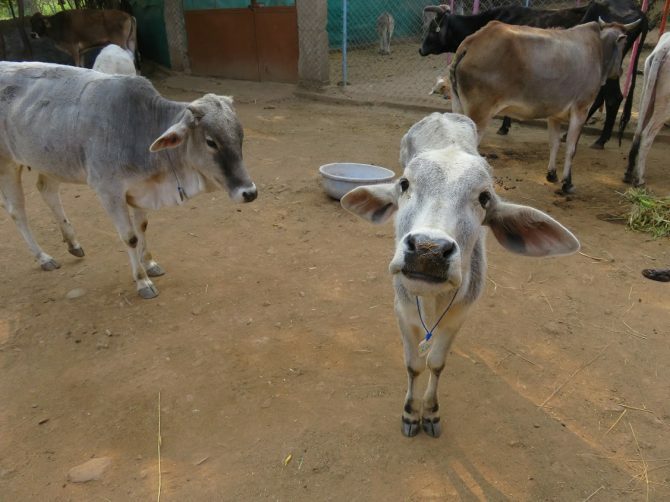 This post is about Animal Aid Unlimited Udaipur and my visit to this animal rescue center in Rajasthan, India that is doing a great job for sick and injured animals. I love animals and travelling in India can sometimes make your heart cry if you look at the state of some of the dogs and cows you see on the street. It makes you wonder if anyone cares at all about the fate of these poor creatures. I was so happy to find out that in fact, some people do. I read about Animal Aid Unlimited Udaipur. They run an animal rescue center and hospital for ill and injured street animals. Tourists can come to visit the center or even volunteer for as long as they like. To get to Animal Aid Unlimited Udaipur I took the local bus to the village of Badi. This is where a family from Seattle settled down and founded the Animal Aid unlimited hospital. Just like me, they were heartbroken by the amount of ill and injured street animals. When they tried to help the animals they found out there were no animal hospitals in Rajasthan. They decided to stay and start their own. In the last 15 years they rescued about 60,000 animals. When I arrived I was welcomed by a team of dedicated volunteers that cared deeply about the animals. There were different sections for dogs, cats, donkeys and cows. The aim is that once the animals are recovered they are released back from where they came from. Some animals are too ill though and they become long term residents. I spent some time with the paralyzed dogs. The caretakers know their names and personalities and guided me to those that would appreciate some extra love and affection. The more time I spent there the more impressed I was by their work. The local volunteers were passionate about what they were doing and managed to spread the word of the animal hospital. It turns out that most people in India care a lot about animals, but simply had no way to help them before. Now they can call Animal Aid Unlimited in Udaipur and they do so often. Communities are getting more pro-active in helping injured animals and Animal Aid Unlimited receive frequent calls from local people about animals in need. What was most inspiring about my visit were the rescue stories the local volunteers shared with me. As cows are holy in India, you would think they have an amazing life, but nothing could be further from the truth. Poverty means that cows are expensive to maintain for people. Male cows are often abandoned, because they don’t provide milk and as they get older no longer provide any benefits. They roam the streets and eat plastic that is slowly damaging their insides. You can not kill a cow in India so many are destined a slow death. Animal Aid has a special section for dying cows to at least give them as much comfort as possible in their last days. They also take care of orphaned calves to prevent the same fate for them. my visit to this center deeply touched my heart. I kept following their work once I was back home in the Netherlands. Their rescue stories on youtube left many tears and smiles on my face. They reminded me that there are good and dedicated people out there that spent their time and energy towards improving the lives of these animals. I hope that I will be able to come back one day and volunteer for some time as it as one of the few NGO’s in India that do truly amazing work. Below is one of the rescue stories that really lifted up my spirits. Animal Aid Unlimited welcomes visitors. You do not need to call in advance and you can just show up anytime, but the best time is between 9 and 12 am. Once you arrive you will receive a tour through the center. The tour is free, but donations are always welcome and you can buy some t-shirts. They are also looking for volunteers. You can volunteer from 1 day to as long as you want. There is no fee to volunteer, but you are responsible for your own accomodation and food. For more information about volunteering look here. Badi is 8 kilometer northwest of Udaipur. By auto rickshaw it is about 30 minutes from the old city in Udaipur. From Chetak bus stand (15 minute walk from old city) there are frequent buses to Badi. From the bus stand in Badi it is a short walk to the animal rescue center. If you want to know more about Animal Aid Unlimited I can recommend this general promo video made by them. This is both heartbreaking and hopeful. I am also glad that there is help for the animals. We saw so many in India. It’s so beautiful that you’re raising awareness on this. Animal Aid does a very important job, it’s often tight on funds and yet they’ve never stopped caring. Volunteers have all of my respect! I felt the same when arriving to Thailand (there are SO many stray dogs there) I’m glad you were able to find a place that takes care of these animals! I’ll have to be on the lookout for something like that in Thailand! Wonderful that someone thought of this initiative and is selflessly providing much needed care to street animals. Sadly, there are many such animals roaming the streets everywhere. More power to the Animal Aid workers. Fantastic post to read and its great that you are bringing this topic up. So happy someone has come up with this initiative and to provide care to the animals. Saving 60,000 animals over 15 years, that is truly astonishing. You showed us a different side to travel and India. Animal Aid Unlimited sure seem to be a worthwhile charity. This is certainly a place I would love to visit! That one photo of the baby cow is just too precious. I wonder- do they do events or anything to help educate the public on animal rights and protection? I did not know that about the cows! I assumed since they were holy they had nice lives. That is very sad but I’m glad to see there are people helping. What a great group of people – It breaks my hear when we travel and see the state of some animals! I want to scoop them all up and take them home with me! what a super article on a great group of people! I visited Animal Aid almost five years ago. It was heartbreaking to see how many injured animals there are in Udaipur, particularly cows, given that they’re venerated, you would think they would be better cared for when one was hit by a vehicle. I’m so glad that a place like this exists though, a place that cares about the welfare of animals. There’s such a big need for people with this mindset. While I agree with Elisa, that India and particularly Rajasthan needs stronger efforts to combat human poverty, but the problems come from very different places and they can be worked on simultaneously. Animal Aid also takes long term foreign volunteers – who can be a big help there, but probably wouldn’t be of much use in dealing with human poverty issues.